Upper Darby Performing Arts Center is proud to announce that tickets go on sale on May 21 for the forty-third season of Upper Darby Summer Stage. The curtain rises for the first of the summer season’s seven musical theater productions on July 3. The series of summer performances includes seven family musicals presented in six weeks, showcasing the talents of young performers from throughout the Delaware Valley. Performances begin on July 3 and end on August 10. The shows take place at Upper Darby Performing Arts Center, 601 North Lansdowne Avenue, Drexel Hill, PA. Tickets for the season go on sale to the public on May 21 may be purchased at the box office, by calling 610.622.1189 or by visiting www.udpac.org. The Mainstage production at Summer Stage is the pinnacle of the season featuring adult performers (ages 18 – 28) in a full scale, Broadway style production with live orchestra. This year Summer Stage presents the Tony Award-winning (Best Musical) 42nd Street, the ultimate show-biz musical that celebrates Broadway, Times Square and the people who make the magic of American musical theater. Performances are July 27, July 28, August 3, 4 at 7:30 pm, with a matinee on August 4 at 1:30 pm. 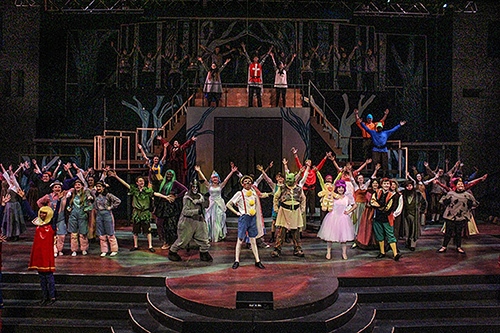 In addition to the Mainstage production, Upper Darby Summer Stage presents six, one-hour long children’s theater musicals including “The Musical Adventures of Flat Stanley, Jr.,” “Disney’s The Lion King, Jr.,” “Disney’s The Little Mermaid, Jr.,” “Freckleface Strawberry, The Musical,” “A Year with Frog and Toad,” and “Disney’s Mary Poppins, Jr.” All Children’s Theater shows are ideal for children age four and up and are approximately sixty minutes long. Performances begin on July 3 (no performances on July 4) until August 10 with performances every Wednesday, Thursday and Friday at 10:30 am and on Thursday evenings at 7:30 pm. There is an additional evening performance of “Disney’s The Lion King, Jr.” on Wednesday evening, July 11 and an addition daytime performance of “Disney’s Mary Poppins, Jr.” on Tuesday, August 7. Upper Darby Summer Stage is one of the most successful youth theater programs in the country as over 750 young people from throughout the Philadelphia region participate in the program. They perform for over 34,000 ticket-holders who enjoy the shows from throughout the metro area. Since 1976 Upper Darby Summer Stage has set a very high standard for live musicals performed by young people. With an artistic vision that includes creating the best possible performances for family audiences, the young people in the program are empowered by the creativity and commitment of the professional staff. The student participants travel from throughout the Delaware Valley to learn about musical theater and perform in Children’s Theater productions, Dance Troupe, Cabaret, and in Mainstage productions. For younger students, the program offers musical theater sessions for children beginning at the age of 10 years old with the Performing St★rts Programs. These classes teach the basics of singing onstage, musical theater dance, acting, improvisation and storytelling through games and fun exercises taught by a qualified and supportive staff. Students are encouraged to develop their creative imaginations and learn to work together to create presentations for family and friends. Summer Stage’s staff of over 100 professional directors, choreographers, costumers, and technicians is committed to providing excellent musical theater training and high-quality performances for families throughout the region. Summer Stage and Upper Darby Performing Arts Center has been recognized three consecutive years as the “The Best Children’s Theater” by Main Line Parent Magazine. HulaFrog recently recognized Upper Darby Performing Arts Center was as the “Most Loved Place to Go” within the Philadelphia region. Founder and Executive Director, Harry Dietzler received the Barrymore Award for Lifetime Achievement in the Arts and in June 2016, Mr. Dietzler received an Honorable Mention in the Tony Award’s Excellence in Theater Education Awards, the only theater teacher in the state of Pennsylvania to be recognized out of a field of over 3,000 applicants. Previous Book Review: Arthur Chang’s Point of Virtue offers a unique point of view.